Yilan County is located in northeastern Taiwan and surrounded by mountains. It faces the Pacific Ocean and mainly consists of the Lanyang Plains eroded by the Lanyang River. The terrain is wide and flat, and transportation is convenient. Since the Hsuehshan Tunnel opened, the distance between Taipei and Yilan has become closer and people can arrive in less than 50 minutes by car. The climate is famous for the abundant rainfall that has reared fertile soil. The unique geographical environment and weather has bred diverse landscapes, agriculture and cultural characteristics. Yilan's former names include "Kavalan" or "Shizaiji" which is a transliteration from the Kavalan tribe who originally lived in the Lanyang Plains, and in the Guangxu reign (1875), this area was designated as a county and named Yilan. According to legends, the Kavalan ancestors came from southern islands, and passed the Fire Island (now Green Island) and decided to settle here after discovering the beautiful and fertile Lanyang Plains. Afterwards, the Kavalan had conflicts with another aboriginal group in Taiwan - the Atayal, and after successfully driving them into the mountains, they became "the residents that live in Lanyang Plains." Yilan County is full of rich natural landscapes, cultural characteristics, and diverse food types. In recent years, through promotions by the Yilan County Government, the Lanyang Museum and the National Center for Traditional Arts were built and are the best showcases for local Yilan County culture and geographic history. In addition, more recently, Yilan has held important exhibitions including the International Children's Folklore and Folkgame Festival and Yilan Green Expo, developing a series of tourism itineraries to promote Yilan as a tourist attraction and to make it more internationalized. Because urban residents now pay more and more attention to recreational life and they hope to temporarily escape from the hustle and bustle of the city, and along with Taiwan's rising concern over food safety, a desire for natural and organic food has been ignited. Because Yilan County offers a rich variety of produce and is only a short trip away, it is one of the best options for short-term travel in Taiwan. ASLIS2014 focuses on the issues of local agriculture, innovative experiences, and sustainable development. Through research and discussions by the research team, ASLIS2014 finally decided to focus on three highly distinctive areas in Yilan County, which are the Jiaosi Township known for its hot springs, the Sanxing Township known for its green onions, garlic, and pears, and the Wujie Township known for its abundant rice production. The "jiao" in Jiaosi sounds similar to "dry" in Taiwanese. According to legend, during reclamation there was a lack of water and Jiaosi even went dry, so it is named "Jiaosi." Now Jiaosi is famous for its hot springs which were discovered when ancient ancestors cultivated the Lanyang Plains, so it is also called "Tangwai." In the Japanese colonial period, the Japanese made use of the hot springs and built hot spring hotels that attracted many tourists. Jiaosi hot springs are easily accessed flat springs, not commonly found in Taiwan, the temperature is around 55 degrees Celsius and they are rich in minerals. Besides Italy, it is one of the few hot springs in the world that contain a "phenol titanium base" which is therapeutic for the skin. The treated mineral water is a health-benefiting drink and tourists enjoy the special hot springs and foot bathing culture obtainable there. In addition, the local hot springs are sodium bicarbonate springs, weakly alkaline and have a temperature about 22 to 23 degrees. They are suitable for the irrigation of fruits and vegetables, and rice, which has helped drive Jiaosi agriculture. Jiaosi's famous "four hot spring treasures" - water spinach, water bamboo shoots, tomatoes and loofah, are excellent in quality, have vibrant colors, and taste sweet and crisp. Secondly, a special characteristic of Jiaosi hot spring rice is that it develops a taro aroma after being cooked. The rice is easy to digest with an excellent texture, and is a famous Jiaosi souvenir. In addition, the kumquat is also a fruit that Jiaosi produces abundantly. The species is oval and has a golden orange rind. The rind is sweet and the fruit is sour so it has a unique taste when entering the mouth. The delicate taste has "medicinal" effects and can stop coughing and benefit digestion. They can be made into different processed food, such as preserves, jam, and fruit tea, which are some of the most unique specialties of Jiaosi. For Jiaosi, ASLIS2014 chose the "Jiaosi Townlan Mall" run by the Jiaosi Farmer's Association, and "AGRIOZ" as learning fields. These two businesses are terminal markets in the "from farm to fork" value chain, and their main value is centralizing local agricultural products. They not only sell local agricultural products, but also extend the effectiveness of the produce through processing which enhances the value of the agricultural products. In recent years, they have actively combined tourism and the culture and creative industries to expand the possibilities of local agricultural development. The "Jiaosi Townlan Mall" located in Jiaosi city is an important channel for the Jiaosi Farmer Association in promoting local agricultural development. Recently, the business has expanded to include the promotion of recreational tourism. It combines Jiaosi hot springs and local agricultural products to provide gourmet specialties and offer experiential activities in order to attract foreign and domestic tourists and enhance the added value of agricultural products. However, due to its poor geographic location, it is often overlooked by customers, and it has difficulty promoting products resulting from a lack of funds and marketing talent. Therefore, in terms of the expectations and needs of future development, the "Jiaosi Townlan Mall" tries to put more effort in cutting-edge packaging design and powerful promotional marketing, and innovative experience itinerary designs, to increase product sales and promote experience courses. In addition, the main products of “AGRIOZ” are kumquat products. The process follows traditional production methods and offers a DIY preserves production class, so besides enjoying the delicious food, customers can also enjoy the hands-on production process and witness the natural and safe methods passed down. This not only builds customer trust towards the brand, but also helps them understand the importance of food safety and increase in land appreciation. In the past, “AGRIOZ” was operated as a family-style kumquat preserves processing plant, but due to changes in consumer types and market demand, she evolved into the current tourism plant. “AGRIOZ” strives to observe tourist consumption behavior in order to further develop innovative service experiences and bring value to customers. Moreover, “AGRIOZ” would also like to focus on proposing innovative experience itineraries and business models, and put in more effort into promotional education and improving sales performance in the future. Sanxing is in the heart of Yilan County, touching the mountains and at the highest point and to the west of the Lanyang Plains. Sanxing's ancient name is "Palisa" which means "bamboo", and it was also the borderline between Taiwanese aborigines - the Pingpu tribe and Atayal in the 17th century. Entering Palisa means you have entered the aboriginal hunting grounds. This type of geographical environment has made Sanxing a frequent location for trade between plainsmen and the aborigines so it is a site with rich cultural impact. Early Sanxing was often flooded and the Lanyang River covered the entire land to form "Sipu." Later, when restructuring was carried out during reclamation, it became a fertile and well-drained alluvial plain so that Sanxing became an important agricultural area in Yilan County. Sanxing's most famous agricultural product the "Sanxing green onion" is a type of four seasons onion and grows up to 50-60 cm in length. Its characteristics include a longer white section, thicker but softer greens, and a sweeter and non-spicy flavor. In addition to Sanxing onions, Sanxing garlic, admiral pears, and silver willow are collectively referred to as the "four treasures of Sanxing." The white Sanxing garlic has less fiber, more moisture, and is sweeter. The name of the admiral pear is quite interesting because this type of grafted pear is grown in Sanxing, and is like the admiral in the army that has "sanxing" (three stars), so it is called "Sanxing Admiral Pear." The fruit is sweet, juicy, and crisp, and has small seeds. Finally, the silver willow is produced abundantly in the winter. The Taiwanese pronunciation of the name is similar to "silver dollar" so it is a very popular decoration during Chinese Lunar New Year. When it's flowering, its appearance resembles a cat's tail so it is also called "cat-tail willow." When visiting Sanxing, the "Green Onions Cultural Center" that the Sanxing Area Farmer's Association renovated from a traditional barn should not be missed. The museum describes the history, methods, and culture of the Sanxing green onion and also sells fresh Sanxing green onion and peripheral products, such as Sanxing green onion ice cream, onion tarts, onion oil, and onion sauce. Furthermore, the owner of the "Green Onion DIY Farm" has designed a farming experience trip and takes all the travelers to an onion farm to pick onions and wash onions and uses the Sanxing onions to make hot onion tarts that people can sample immediately, it is an experience trip that is very popular among tourists recently. Finally, Sanxing also has a famous traditional rural village - "Xingjian Organic Dream Village." The Xingjian Organic Dream Village is located in the west of Sanxing Township and is an organic village that a group of old farmers averaging 65 years old developed. They use no pesticides and no chemical fertilizers, and send the organic rice from the farmers to the buyers through the Internet directly. The organic cultivation of duck rice is another major feature, and is where baby ducks grow up with the rice seedlings because the young ducks can get rid of pests and clear weeds and their droppings become natural fertilizer. You can see the special scene of ducks in rice patties at Sanxing Township. For Sanxing, ASLIS2014 chose to cooperate with "CongManLiXiang" as a learning field that is well-known for growing the famous Sanxing green onion, as well as the "Xingjian Organic Dream Village.” Among the two, CongManLiXiang is a self-sufficient smallholder in the production end of the "from farm to fork" value chain, while Xingjian Organic Dream Village is a local experience and sales platform initiated by local farmers. CongManLiXiang's owner Mr. Lin Donghai was originally a chef, and after his restaurant failed, he listened to his father's advice and returned home to grow green onions, which triggered his aspirations for Yilan's local agricultural development. As a chef, he hoped to make Sanxing green onions the main focus on the table. In addition, he hopes that Sanxing green onions have more diversity and possibilities through different food processing methods. Through ASLIS2014, Mr. Lin wishes that he could be aware of more creative experience designs so that customers can increase their sense of identification through the experiences. Besides increasing the added value of Sanxing green onions, he hopes to help promote the importance of organic farming eventually. 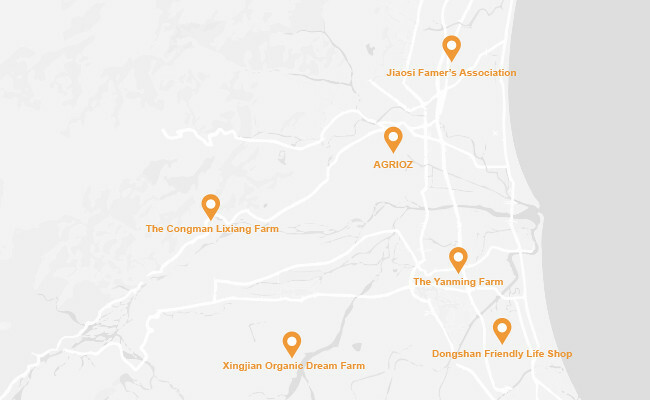 On the other hand, "Xingjian Organic Dream Village" has been established for five years, and the growing number of organic farmers and agricultural land, represents the local consensus and unity towards friendly organic farming. The promoter Mrs. Zhang Mei has always hoped that through village cohesion, it can help smallholders grow and develop, and the concept of organic villages can be promoted all over Taiwan. In the future, she hopes that the various activities in the Xinjiang Organic Dream Village can grow in scale to become in-depth experience itineraries, and the "Xinjiang Organic Cooperative" can become a platform for recreation, farming experiences, tasting organic food, and sales. Although the operation methods for this area have not been planned in detail, Mrs. Zhang hopes she can reflect on how to expand the Cooperative to become an experience field, and to create an organic farming promotion stage that is integrated with the environment through ASLIS2014. The Sanxing green onions planted by Mr. Lin Donghai. Scene from Xingjian Organic Dream Village. Wujie is located to the east of Yilan and is at the opening of the Lanyang River to the sea. In the Qing Dynasty, Yilan was a reclamation unit for tenant farmers that used the Jieshou system, and Wujie is where the fifth Jieshou was located so it is called Wujie (fifth jie). Wujie is excellent plain terrain located downstream of Lanyang River, the water is slightly alkaline, the temperature is slightly higher, and the soil is fertile. It is the only area that produces rice year-round in Taiwan. The rice is planted around February and is harvested around July. The land can fully recuperate so Wujie is known for its ability to provide large amounts of high quality rice. The Wujie Township Farmers' Association is committed to the promotion of Wujie rice and hopes to "realize their dreams in the rice fields"; therefore, they created the "Wujie Dream Farm Yueguang Rice" brand. The high-quality rice is packed into engagement gift boxes and gift packages and has become a well-known local souvenir. Meanwhile, the "Wujie Dream Farm" is also a dream land of Wujie. This site is transformed from a traditional barn and people can learn about the process of how brown rice becomes white rice in this rice factory that is currently operating. They can also tour the rice mills and make dumplings or rice balls. The Dream Farm hopes that through its promotion, more people can understand the production process of white rice. Wujie is famous for its "Wunong Rice", an excellent rice barn is the Siaowei Barn, and after shelling, separation, husking, drying and other processes, the rice is preserved in low temperatures to maintain its freshness. Through the "Lanyang Wunong Rice" assessment held each year, Wunong Rice has become a representative of good quality rice. In addition, the "Yueguang Rice" is a top representative for Wunong Rice and grows from Japanese seedlings the Wujie Township Farmers' Association introduced 10 years ago. The rice is transparent, full, sticky, chewy, and has an extraordinary texture. From the cultivation to promotion of rice, Wujie Township enhances its agricultural value and implements friendly agricultural practices, and besides planting, they also combine recreational agriculture so more people know about organic rice and it has become a famous township for high quality rice in Taiwan. Another local smallholder, Miss Lai Chiaoyan and the "Friendly Life Shop" in the nearby Dongshan village, were the learning fields the course chose to cooperate with in Wujie. In the "from farm to fork" value chain, Miss Lai is an organic smallholder in the production end, and Friendly Life Shop is a local sales platform promoting organic ingredients. Miss Lai learned agricultural techniques and food and farming education in Japan and took what she learned to Yilan. She is personally involved in the promotion of organic agriculture and food and farming education, and started teaching classes at the community college and publishing books teaching people about the characteristics and planting methods of organic produce. But the biggest hardship Miss Lai is currently facing is the lack of agricultural human resources because organic production requires a lot of manual labor. She mentioned that in the future she hopes that more youth can become interested in organic farming through experiencing or work exchanges, and even become "new farmers". The "Friendly Life Shop" proposes a friendly attitude towards life, and besides organic farming, it combines the concepts of environmental protection and environment coexistence. This store mainly supports, "new farmers" with friendly concepts, so that they can sell food produced through friendly produce concepts in this platform, and take the first step towards sales. The shop's scale is more conservative and is centered around the community. Operations rely on volunteers with the same ideals, and how to replicate the operation concepts in other areas are the difficulties and challenges it is currently facing. Therefore, the shop manager hopes that besides using innovative marketing or experience methods to increase sales volume, the friendly spirit can also be passed on beyond the community, and the concept and lifestyle can be spread to other areas in Taiwan. The organic strawberry garden grown by Miss Lai Chiaoyan. The outdoor sales point of Friendly Life Shop.